If I buy a book, I always want to keep it, even if I did not like the story, or don't intend on reading them again. I always think 'oh, but I might need it some day', It has got to the point, however, that I no longer have enough room for them all, so have to make the painful decision to get rid of some. Do you tend to keep all the books you buy, or do you read them and pass them on? I was just going to post something closely related to this (about getting rid of books). I don't keep all of my books. I'd never have the room for that! I live with three other book lovers and if we all kept everything we'd have no room for anything else. I keep those I plan to read again or use for reference. If I didn't like them or just don't think I'll read them again I give them to opshops or I get rid of them through Bookcrossing (a sort of online book club devoted to "making the world a library" by leaving tagged books in public places for others to find and journal). I keep those that I know I will read again, or have some particular meaning to me (ie. were given as a gift). But any that I don't like get donated to charity straight away. I figure that I didn't enjoy it, but someone else out there who might not have the means to get the book themselves might. One of the reasons I used/still do hoard my books is because I thought they might be useful for reference in my studies. Even after I finished Uni, I still kept them on the off-chance. Now though, I realise that I can't keep every book. Post 2012's domestic flood (refrigerator) I have 5 boxes of books I am trying to unload. Many are in mint condition, but I don't see the point in keeping any of them. Some will be sold to a local dealer and the rest will go to the University of Queensland's Alumni book sale. Anything I consider useful or of sentimental value I will keep. I pass some of them on, but there are some I am so attached to I can't let them go. I used to have a fairly decent collection of good sci-fi books but let them go when I moved to a smaller home - and I regret it now. :) But hey, when you clean out the bookshelf, it's good for your soul (getting rid of clutter) and there's more room for more books! I do keep a lot of my books, however, like Bryony, sometimes I have to get rid of some of my books as I end up with so many. I like to read a book, then keep it as I might go back and read it one day. I don't often have time to go back and read them again, though. I used to read a lot of books on paper. So I would buy lots of books, but then take them down to the second hand book store to get credit for getting more books. Each time I would do this I would go through the books that I have read and select out the ones I would least like to keep. Sometimes I would be reluctant to give up some book, but at the same time I knew that if I traded it in the reward would be a new reading adventure. Now of course all my books are electronic. I don't even need to keep the electronic books because they are stored in the cloud where my purchase as been recorded. At any time I would like to access that book again, anywhere in the world, using my computer, tablet or phone, I can. I rarely buy books any more. I make use of the Library. I am in the process of culling yet again. I am down to one bookcase and I rarely read any of them. However when it comes to books I used in teaching , that's harder as I haven't yet retired so am having a harder time getting rid of them. Books are something very special & precious for me. I'm alway reading & listening to music that's Classical,Jazz rock,Rock,Rockblues & I've a great collection of Records & CD's. It's hard for me to part with them.We're always building a new book case & trying to find a spot to keep it.When I see my collection of books I just feel very happy & peaceful inside.As for me at least the EBook can never replace a book. A book that you can touch & feel it when you turn the page,the smell of the book either it be new or a very old copy of a rare book you got from second hand book store..Books, books I just love them. I can read in bed,read in my comfortable chair,while standing,while in kitchen & while sitting in the john. My god just imagine a world without books,newspaper & music. In my younger days I remember reading in the attic,reading high up on a tree where no one could find me. I don't keep all my books, although I would love to. There are a few I have held on to despite moving continents. 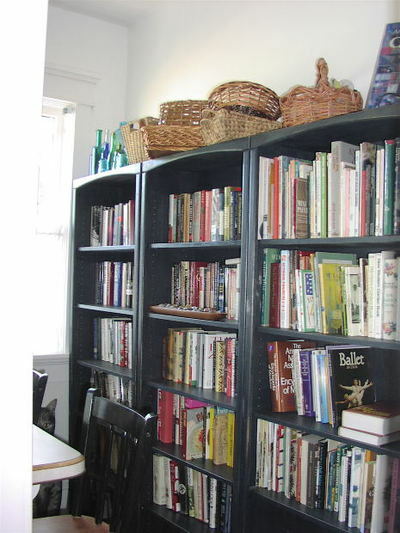 If I really like a book and can't keep it (for lack of space or if I am moving, etc. ), I prefer to give it to a friend who may appreciate it, instead of giving it away or selling it. I mused to keep all my books, I was almost completely unable to get rid of them. Then we renovated our kitchen and several of the bookcases lost the walls that backed them so …… tough decisions had to be made! To compensate me for giving a huge number of books to the local community centre my partner gave me an e-reader. I used to think I loved books, the feel of them, the smell of them, everything about them, but now I love my e-reader. Lying in bed holding a light e-reader vs holding a heavy book makes it the best modern transition I've ever had! Buuuuut I kept all my Robin Hobb Books ….. Yes, My Partner is constantly complaining about the number of books I own and My son has gotten this from me also. I can't bear to part with any of my books. I don't know what I'm going to do when I run out of room. I suppose I'll cross that bridge when I get there. I keep the ones that I buy to collect i.e. my old children's illustrated books however do not keep fiction. I usually keep all my books. I love looking through my library and seeing what I've read and I just find them a great feature of a room. I get books to read from Library. Cheaper that way. IF I buy a book, it will be kept, as was wanted in the first place. If I come across books that I don't want anymore, they're always in excellent condition, so 'donate' them to my local Library to put into Council circulation. That way, others' get the enjoyment of my former books! I try not to buy books anymore unless I know I absolutely want to keep it. If it's a special crafting book, one I know I will use often, or something that I think will be hard to get one day, I'll buy it. With most books though (mostly novels), I'll just borrow them from the library. It's too hard to find room for them all otherwise and it's too hard to part with them if I find I do have to make space!